(Photo by SF Beer Week). 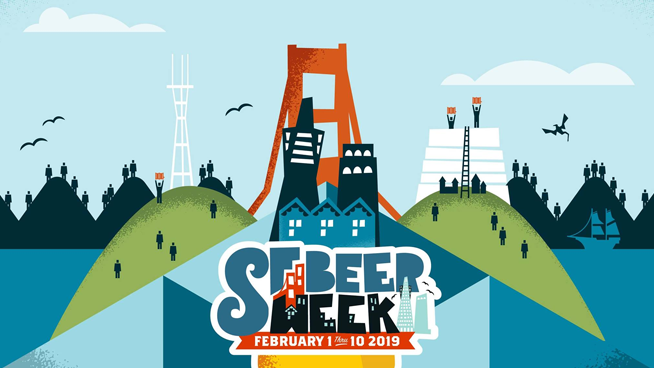 With the start of the new year, it’s hard not to instantly start the countdown to Super Bowl…but if you’re into beer, the new year holds a different meaning: San Francisco Beer Week. This year, marks the 11th annual San Francisco Beer Week kicking off on Friday February 1st. For 10 days, fans can enjoy the best from local favorite taprooms, restaurants and breweries in a variety of events including trivia nights, meet and greets with brewers, and tap takeovers. The Opening Gala is a must for any beer enthusiast where both veteran and amateur beer lovers alike can take in the flavors of the potential line up of over 100 breweries.The Opening Gala is the premiere beer fest where you are guaranteed to find something new and excitin from all the regions, including the new Coastal region. From the mouth watering sours to the funky hop fueled double or triple IPA’s all the way to special barrel-aged brews that haven’t seen the light of day for years, the Gala is a must, especially if you don’t want to wait in line at Russian River Brewing for that taste of Pliny the Younger. The truth of the matter is, beer brings the Bay Area together and it’s time to celebrate this incredible beverage. If you head on over to sfbeerweek.org you can of course purchase your tickets to the Opening Gala but you can also see all the participants for this year.